The pivotal moment in Steven Soderbergh’s Netflix production “High Flying Bird” occurs when two fledgling NBA players talking trash across social media during a leaguewide lockout on account of differences between labor and management suddenly find themselves face to face at a charity event in a small Bronx gymnasium. Forbidden from settling their score in official competition, they dare each other to a game of one on one. Yet just before the showdown commences, Soderbergh cuts away, limiting us to a couple oblique glimpses through a smartphone video later in the film. This is not, however, merely Soderbergh as haughty provocateur, depriving us of what we want just because he can. No, this is a continuation of the movie’s theme, explicated by the hard-bitten coach, Spence (Bill Duke), overseeing the charity event, as modern basketball being about “the game on top of the game.” It’s the game masterminded by avaricious white men in tall buildings rather than the game born on concrete courts, a series of transactions supplanting the sport’s streetball roots, which is why the cinematography emphasizes sleek office towers, as if employing that shot from Spike Lee’s “He Got Game” overture where the World Trade Center looms over a young kid shooting buckets as an overall theme. 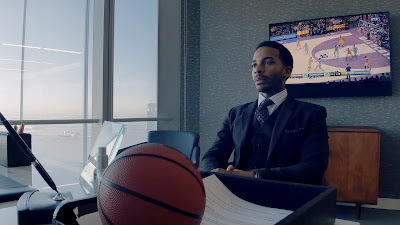 Soderbergh, however, seeks to honor the sport’s streetball roots by essentially turning the entire film into a series of one-on-one, give or take, conversational showdowns, including the opening stanza where agent Ray Burke (Andre Holland) chastises his promising client, lauded first round draft pick Erick Scott (Melvin Gregg), for having taken a high interest loan during the lockout. Set in a glitzy restaurant, Soderbergh obliterates the 180 degree rule by shooting his two actors from every conceivable angle. Even if this flouting of cinematic convention retains emblematic weight, it is akin to a bout of swaggering streetball in the manner of, say, Coney Island legend Steph Marbury – snazzy and ostentatious. Even so, the scene ends with a nice narrative twist when Ray’s financial harangue concludes with his credit card being declined, betraying his precarious job status given that no NBA players are currently playing games. This necessitates a need to end the lockout which eventually ties back to that spontaneous one-on-one game making the social media rounds, threatening to usurp the owners’ bargaining power guerilla style, all of which gives Soderbergh’s decision to shoot on an iPhone an extra emblematic kick. All this wheeling and dealing, despite involving the NBA global monolith, remains limited to but a few principal players, likely a budget constriction the iPhone photography suggests, with an unctuous Kyle MacLachlan representing the ruling class and Sonja Sohn standing up for the put-upon labor. Wedged between them is Ray, and standing alongside him is Spence, played by Duke with maximum gravitas, as figuratively rock-like as is possible, immovable in his principles, frequently peering out from beneath his ball cap with bright white eyes that truly evince the notion of having seen everything. The movie’s best joke, and a recurring one at that, is every time someone equates modern athletes with slaves, a common sportswriting refrain, Spence forces everyone to recite his mantra: “I love the Lord and all his black people”, like a makeshift preacher reminding his charges what’s most important. It illustrates Spence’s compassion, and he emerges as the lone well-rounded character, where despite these notions of black NBA players as mere commodities a fundamental humanity in the other persons present is conspicuously lacking as Ray’s backstory remains unbaked and Erick’s personality can come across as un-lived in as his apartment. Still, ideas all on their own can yield drama and tension, and it is the ideas woven into conversations and taking root in Ray’s ultimate scheme that animate “High Flying Bird”, all of which screenwriter Tarell Alvin McCraney refuses to dress up in easy-to-digest metaphors a la “Margin Call”; it can be hard to keep up, but also invigorating. Ray’s scheme, without entirely giving it away, ties back to how the social media influence of that spontaneous pickup game unlocks the potential earning power that both Ray and Erick hold and can dangle over so many boardroom suits, honoring the film’s own DIY roots and highlighting how a pickup game revenges the game on top of the game. Despite their ultimate plan’s complexity, however, it narratively locks into place with odd pressure-free ease, diffusing any sense of surprise. 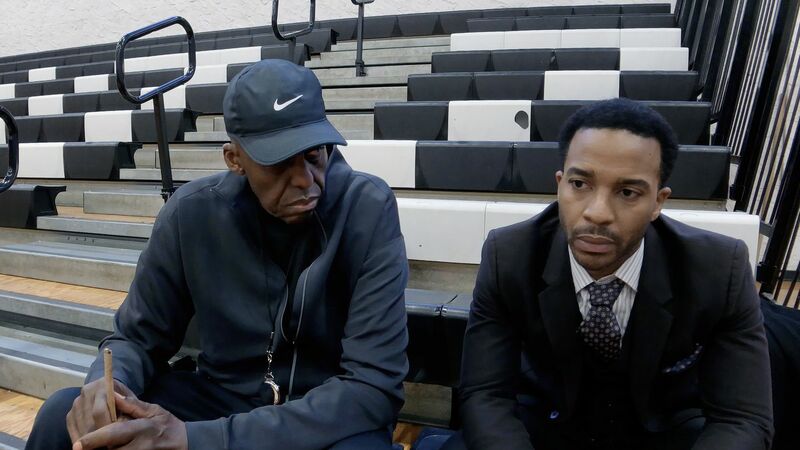 Then again, “High Flying Bird” modifies its seeming MacGuffin right at the end, transforming a manila envelope from a device into a battle cry, leaving the more assiduous viewer with a little voluntary homework.